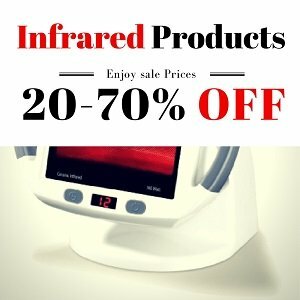 Looking for the best 2-person infrared saunas for home use is one of the best things you’ve ever done for your health. 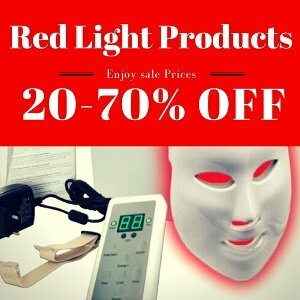 The staggering amount of health and beauty benefits of infrared saunas can literally make your jaw drop. And, a 2-person sauna is big enough for two people, yet small enough to fit an average room. Which is the best and safest 2-person infrared sauna, for the least amount of money? We’ve researched long and hard to find the answer, and you’ll find it here: Reviews and ratings for the 3 best 2-person infrared saunas in the market. An infrared sauna can be the ultimate health-promoting tool you’ll ever have, but only if you follow a few important quality and safety rules before you buy one. For example, it has to be built with the right type of wood, and it has to be low EMF (electromagnetic field) radiation. We’ll explain these examples and a few more important features below. 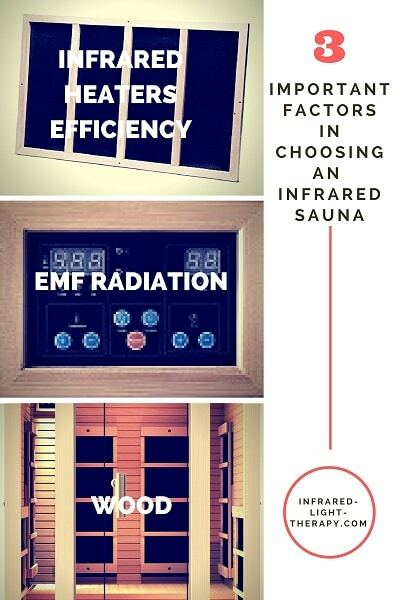 Choosing a low EMF infrared sauna is the most critical factor for your safety. A safe level of EMF is considered to be anything below 3.0mG. Through our research, we’ve found that there’s no zero EMF infrared sauna out there, but as long as the levels are at the safe readings, the difference between 2.0mG and 0.05mG is not critical. In 2019, the most popular home infrared saunas use carbon as a heating element, which is better than the Ceramic used in old saunas. However, carbon inherently emits higher EMF. The best far infrared sauna brands have reduced the EMF levels emitted from their carbon levels via protecting layers. If you are looking for the best NEAR infrared home sauna – this is the best one in 2019. 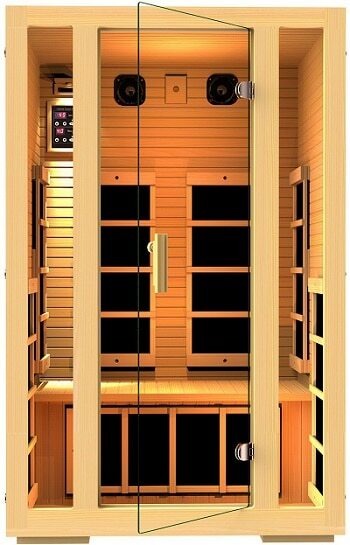 The three 2-person infrared saunas we recommend below are all low EMF (under 3.0mG). If you are looking for the lowest EMF sauna in the market, you’ll want an infrared sauna that has EMF wire shielding throughout the entire sauna, not just the carbon panels, like the JNH Lifestyles NE2HB1 ENSI. 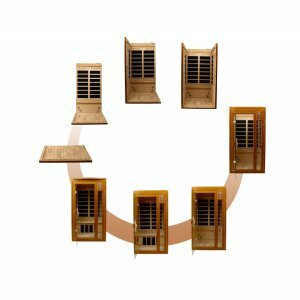 The material construction of the infrared heaters inside the sauna determines the quality of heat reaching your body, and ultimately the quality of your infrared sauna. Ceramic – considered as the old infrared technology and have a small infrared emission surface and a shorter lifespan. Many manufacturers still offer them because they are cheaper than large high-tech carbon heater panels. Carbon heater panels – considered most advanced infrared heating systems. They have a greater heat distribution potential. Plus, the surface temperature of carbon heaters is lower (about 150-170 degrees F). With carbon heaters, you get an even, effective infrared exposure over your entire body, no matter where you position yourself in the sauna. Ceramic/carbon blend – the cost-effective best of both worlds solution. It combines low EMF (from ceramic), efficient infrared emission and an affordable price. Since the quality of and efficiency of the infrared heaters determine how well your infrared sauna works (more benefits/less time for results), we recommend only buying a carbon heater/ceramic+carbon infrared sauna. Western red cedar – high quality, naturally durable, light, has high resistance to decay and known for its pleasant aroma. The main benefits of cedar are its beauty and its durability (which is more important for an outdoor sauna than an indoor one). Nordic spruce – European in origin, light in color, no-odor material, and has a slight resistance to decay. Canadian Hemlock – the least expensive one and requires mild treatment from time to time. However, its hypoallergenic properties, along with a good balance between weight and strength, make it a good choice for an infrared sauna. All these wood types are nontoxic and fit for an indoor sauna (that isn’t exposed to hard environmental conditions). The more economic infrared saunas use Canadian hemlock, which lowers the total price. And now, let’s get to the point. Now that you know the important factors in buying your infrared sauna, it’s time to expose our top 3 choices in home infrared saunas, for 2 people. If you’re in a hurry, here’s a short and sweet comparison between the 3 models. Below the table, you’ll see our full review for each one with important specifications. See more details plus pros and cons – below the comparison table. 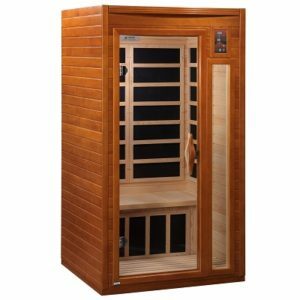 Dimensions 47.3" x 75" x 39.5"
The JNH 2 person infrared sauna is our #1 choice, combining quality construction, efficient infrared carbon heaters, low EMF, good style and a fair price-tag. 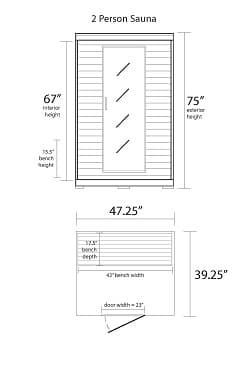 Door size: 65.0″ high and 23.5″ wide. Hinged on the right. The door will extend 23.5″ from the unit when the door is open at 90 degrees. Easy to unload and assemble. Takes about 30 minutes once you finish unloading the parts. Made with “green” wood, no chemicals added. Canadian Hemlock is a good combination of strength and weight. Takes 10-15 minutes to reach 125 F. Pretty quick. No backrests. However, you can easily get ones on Amazon. 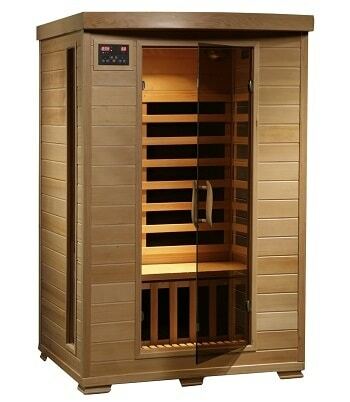 The JNH carbon infrared sauna is high-quality engineering and planning for its price. It’s stylish, made with good material, safe to use and comes with great customer support. It’s easy to unload and assemble and has a fair price tag. The Radiant Saunas home infrared sauna is our #2 choice for the best home infrared sauna. Made with solid Hemlock wood, this one has 6 carbon heaters, including a floor heater, and features 7 color therapy light. Plus, it is loaded with extras, as you’ll see below. It has adjustable roof vents that you can open to the outside air if you need some fresh air. The Radiant saunas infrared sauna is high quality, it has great add-ons, smells great, has a low power consumption yet high infrared emission and is easy to assemble. 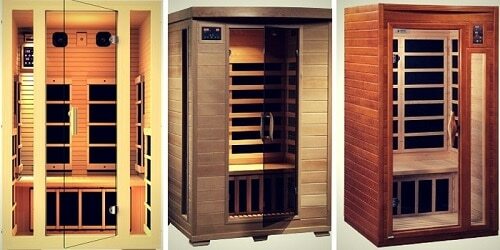 The Dynamic Saunas Barcelona infrared sauna (6 carbon panels) is the least expensive one on our list. The Barcelona infrared sauna is built with reforested Canadian Hemlock wood is double paneled constructed with the thickest interior and exterior wood planks. Can be installed on a carpet and at any indoor location, including the basement, garage or walk-in closet. Easy assembly – takes 30-45 minutes. Any phone, MP3 player with a 3.5mm port hooks to the speakers. It comes with the wire to attach your device to the speakers. Comes with a remote for the lights, the inside-outside control panel is very convenient. Some people would say that calling it a 2-person sauna would be a stretch. These two persons should really like each other to go in together. Foot heater does not get warm enough. However, sitting sideways on the bench takes care of that. The Barcelona infrared sauna was the first we had seen at this very favorable price point, at a size that would fit easily in the house, and does not need special wiring. We concluded that it’s high quality relative to its price. You’ve just found the 3 best home infrared saunas in the market with a fair price tag on all three. Our #1 choice is for a 2-person infrared sauna is the JNH Lifestyle Sauna. It’s built with high-quality materials, it has low EMF and infrared emission is high. If you’re looking for the safest infrared sauna, with the lowest EMF reading, take a look at the JNH Lifestyle NE2HB1 ENSI No EMF Sauna. Owning a state of the art, the well-constructed home infrared sauna is extremely cost-effective when considering the huge dividends paid in terms of physical and mental health benefits. The 2-person saunas are our favorite because you can use them with a friend or a loved one, while their size fits most average rooms. Plus, they’re more affordable than a larger sauna, yet offer the same health benefits. 1. Do Infrared Saunas Use a Lot of Electricity? You may be surprised to find that most infrared home saunas do not use a lot of electricity at all. Using a 1000W sauna for one hour will cost you about 12c. If you use your IR sauna for an hour every day, it will cost you less than $5 per week. 2. How Many Times a Week Should You Use an Infrared Sauna? Since infrared rays are actually the same heat you get from the sun, ask yourself – how many times a week can you be out in the sun (without the UV rays)? IR saunas are safe to use daily. In fact, you’ll get quicker results if you use it often. As always, listen to your body and if at some point you feel uncomfortable – stop for a day or two. 3. How Long Should You Stay in an IR Sauna? On average, most people sit inside the sauna for 30-45 minutes. As long as you reached the point of sweating all over your body, or when you feel your pain relieved – you’re done. I hope you’ve found my research and conclusion helpful and time savings. Please let me know if you have any other questions or concerns – in the comments below. They are all made with carbon. All of the saunas in this post use carbon heaters – not ceramic. As explained, almost no one makes infrared saunas with ceramic heaters anymore. High Tech Health uses ceramic heaters and claim they are superior to carbon heaters. What is your take on that?